Helen Bones writes to Jessie about her trip home and the people she met along the way. How happy I feel about you, with your perfectly satisfactory husband back once more and you with nothing at all to worry about, except the awfulness of this pen! I'd like to be there just to see how happy you are. Do you know, I was not a bit pleased, on Friday, to meet Miss Hopkins for I hate having to talk to any one on the train; but before we reached Troy I was ashamed of having felt as I did at first. In the first place, she is a delightful person, apparently quite as desirous of occasionally being silent as I am and always interesting when she does talk. And though she declares she's not a good traveller, as she worries over what may happen wrong, she took care of me like a regular Miss Cook. I found my friend, Margaret Nade, waiting for me and was greeted with the news that she and her husband were going to Syracuse at midnight. I wanted to go to the Stratford, but as she declared the Biltmore had just as cheap rooms I stayed there. But as soon as I had deposited my bags she and I went down to the Stratford to see whether or not there was any word from Pole. There was none, but on the a page of the open register lying on the desk I found Marion's mother-in-law's name; also that of her sister-in-law and many other in-laws, so I sent up my name and had a nice visit with Margaret , Marion's sister-in-law. The next morning I went down again and saw Mrs. Erskine and some more relations and friends. All of them were in New York for the wedding of Barts brother—I having quite forgotten to send any reply to his wedding invitation or to send him a gift. There being no word from ole, and Margaret having gone home, I came on down to Washingtont on the one-eight train. I telephoned Margaret Wilson first and found that your father and she were to get home at ten-fifty-five tonight. I was so tired that I decided it was better to come home, so and I have spent today in bed. I have gotten up to meet them.Nell came in last night and again this afternoon. She seems pretty well except for a cold. She and Cousin Lucy prepared the enclosed chart which I'm going to beg you to return. Isn't it too killing! Their idea was to show how quickly my beloved puppy had forgotten me. The same puppy is very sweet, but not a bit well. I'm afraid he has worms, which appears to be the next disease to look out for. I may say I wish I had chosen the older dog Mrs. Davis had offered me. A baby dog is more trouble than a real baby, apparently. Well it's almost time for the President to arrive, so I'll stop scribbling with this terrible pen. Honey, I had such a good visit with you! I just can't tell you how I enjoyed it and how restful it was to be with you in your sweet little house. You were so precious to me and I'm so happy about you that I shall live for a long time on the part of a week I had with you. 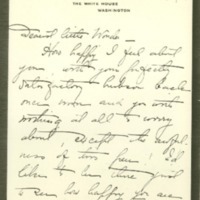 Bones, Helen Woodrow, “Helen Woodrow Bones to Jessie Woodrow Wilson Sayre,” 1914 November 15, WWP17505, Jessie Wilson Sayre Correspondence, Woodrow Wilson Presidential Library & Museum, Staunton, Virginia.